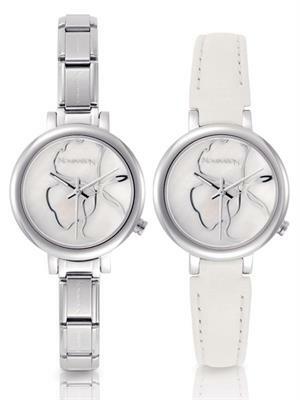 Transform your Nomination collection for the new season with the fabulous Paris Watch. This stylish design features a beautiful mother of pearl dial with a pretty open flower and sparkling cubic zirconia stone. This unique timepiece comes with two interchangeable straps including a stylish white leather band with a buckle strap and a classic Stainless Steel link bracelet. Show off you individual style by swapping the links with your most treasured Nomination charms.